Some further documentation is included: on 16 August 1817 the Archbishop of Canterbury issued an order that the will should be released by the Archdeaconry of St Albans, where it had been proved, because the testator held “Goods Chattels and Credits in divers Dioceses or peculiar Jurisdictions within our Province of Canterbury sufficient to found the Jurisdiction of the said Prerogative Court”. The will therefore came under the jurisdiction of the PCC not of the Archdeaconry. The note at the end was evidently written when it was sent to the PCC, where according to the National Archives index it was proved on 29 August 1817. 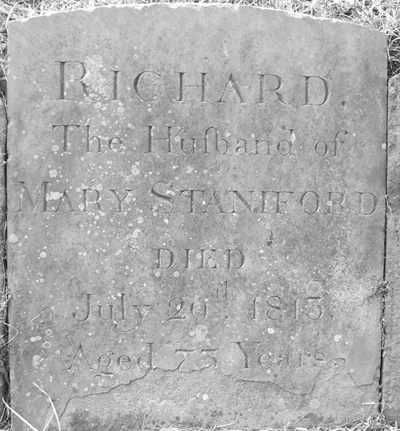 Richard Staniford is presumably the "Mr Stanniford", bricklayer, who built the bridge at Addington for the Wendover to Buckingham Turnpike Trust in 1795 at a cost of £114 4s 7d. See S. Eveleigh, "Bridges on the turnpike road from Wendover to Buckingham", Records of Bucks 52 (2012), 191-202.